I have a love for angels that goes back to a childhood picture of a guardian angel watching over two children crossing a bridge. I’m sure that print has hung over many cribs and beds. I often marveled over that angel and its beautiful wings. As a Catholic Italian boy on Buffalo’s West Side, I went to Holy Cross School. We were told all about God, saints and sinners. My favorite stories were always those of angels. What always fascinated me was their power and merciless punishment. Yet angels are said to be unspeakably lovely and have no shadow of imperfection or defects. They are gentle and love all beings except enemies of the Lord. Through my life, I have tried to follow some of these ideals. Too much generosity and compassion have gotten me into trouble at times, though they made for a balance with my darker side. I believe an angel covered my back in Vietnam for a year as well as other black periods in my life. It made sense that my three sons should be named Raphael, Michael and Gabriel, they are always my light at the end of a dark tunnel. 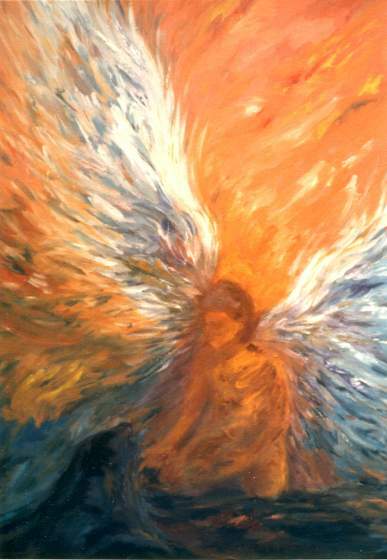 The angel in my painting offers light, love, and life to an otherwise hopeless situation.